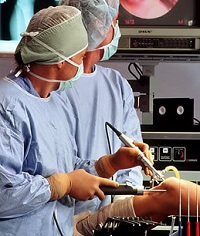 ACL reconstruction surgery involves replacing a torn anterior cruciate ligament with graft tissue from around the knee. If other structures in the knee have also been damaged at the time of injury, such as the meniscus, they are also repaired at the same time. In many cases, surgery can be avoided after ACL injuries by working on an intensive rehabilitation programme. However, if there is persistent pain and instability, or for high-level athletes, ACL surgery is advised. The ACL is the key stabilising ligament of the knee and is most commonly damaged when the knee is excessively twisted or pushed too far backwards. Here we are going to look at the indications for ACL reconstruction surgery, the different types of ACL graft that can be used including the pros and cons of each and what happens during surgery. 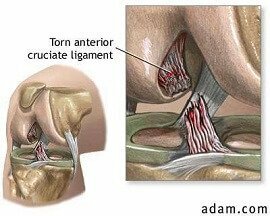 We will then go on to look at the recovery and rehab process and the potential problems associated with ACL reconstruction surgery. If you want to know more about how anterior cruciate ligament injuries happen and other treatment options besides surgery, visit the ACL knee injury overview. Lots of people respond well to exercise rehab programmes and are able to function perfectly well with an torn ACL, but sometimes the knee continues to feel unstable and may give way. This can be painful, often limits activities such as sports, and makes the knee more prone to damage. 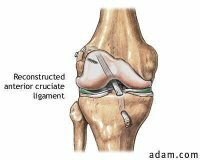 In ACL reconstruction surgery, the damaged ligament is completely removed and replaced with a graft that simulates the anterior cruciate ligament. This graft can be created from other soft tissues either from around your own knee (autograft) or from donor tissue (allograft). Let's look at the three types of ACL graft used and the pros and cons of each. The hamstrings are a group of 3 muscles found on the back of your thigh. Sections of two of the hamstring tendons (Semitendonosis and gracilis) are removed and then doubled over to create a 4 strand graft. 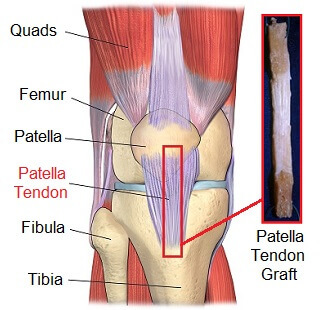 The patella tendon is found just below the kneecap. The middle third section of the healthy patellar tendon is removed from the front of the knee, along with small sections of patella and shin bone which are still attached to the tendon at either end. The pieces of bone are then grafted onto the knee where the ACL was previously attached. This is the least common of the three. It tends to be used for less active patients or those undergoing revision (repeat) ACL reconstruction surgery. It involves using donor tissue from a cadaver. Surgeons often have a type of graft they prefer to use in ACL reconstruction surgery, so discuss the options with them. ACL reconstruction surgery is usually carried out arthroscopically (keyhole surgery) under general anaesthetic and takes approximately 1-2 hours. 3 very small incisions (cuts) are made around the front of the knee. A flexible camera with a light (an arthroscope) is placed through one hole which sends images through the fibre optic cables to a TV monitor in the operating room. 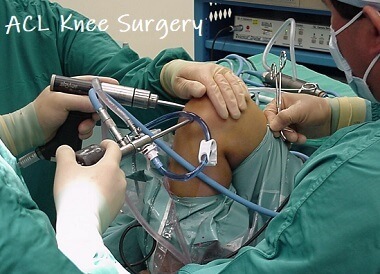 The knee is examined to confirm the diagnosis of a ligament tear and to look for any cartilage damage. Saline fluid is pumped into the joint to wash out any blood and debris and to expand the knee so the surgeon has a better view of the joint. Medical instruments are inserted into the knee which have the necessary tools attached to them to carry out the operation. Tunnels are drilled into the thigh and shin bones (femur and tibia) ready for the new graft. A separate incision (about 2-3 inches) is made to obtain the new ACL graft (known as harvesting) from either the patellar or hamstring tendons. The graft is prepared to the right length and width as described above. Once the torn ACL and any debris has been removed, the graft is then fed through the tunnels and the top is attached to the femur, usually by a screw (metal, plastic or calcium based product that turns into bone). Tension is then placed on the graft to ensure it is the right length and it is fixed to the tibia. In time, new bone will form at the attachment sites, making it even more solid. 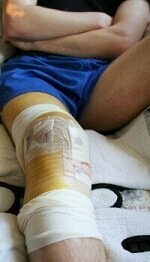 Any damage to the meniscus will then be repaired or tidied up and the wounds will be closed with stitches. A sterile dressing will be applied that is worn for the first few days while the wound starts to heal. Following ACL reconstruction surgery, you will be taken to recovery for 2-3 hours. People are often able to go home later that day, but sometimes you have to stay on hospital for a day or two. The surgeon may want you to wear a knee brace for the first few weeks to protect the knee. After surgery, there is a long rehabilitation programme to regain full strength and stability, usually 4-6 months. Most people do get back to playing full contact sport after 6-12 months of rehabilitation, but not everyone returns to their pre-injury level. You can find out more about the process, including a recovery timeline guide with information on how long it takes to get back to certain activities in the ACL recovery section. The aim of ACL reconstruction surgery is to prevent repeated episodes of the knee giving way or buckling. Research has shown that in the long-term, approximately 90% of patients feel their knee has returned to full function, or nearly full function after ACL reconstructive surgery. Whilst ACL reconstruction surgery is usually extremely successful, it is normal to have some problems in the early days after surgery such as pain and swelling. In rarer cases, there may be ongoing problems with instability, patellar pain and stiffness, along with a small risk of re-rupturing. You can find out more about both the common and uncommon issues in the problems after ACL reconstruction surgery section. ACL reconstruction surgery is just one option with a ligament tear and isn't always appropriate. You can find out more about the different treatment options for an ACL tear in the ACL surgery overview section. If you want to find out more about the causes, symptoms and diagnosis of ACL tears, visit the ACL knee injury section.